I wasn’t sure whether to write about this story or not, since so many people have already reviewed it. But, I just learned that there is a movie in the works for this, so I thought I’d throw my own experience into the pot as well. Ta-da, I’ve finally read a John Green novel! This was sort of a strange book for me, way before I ever started reading it. I’d heard so many good things about this novel, and so many good things about John Green in general, that I knew I had to read it. But normally, this is totally not the type of book I would choose to read. What can I say? I am a sucker for happy endings (with the possible exception of horror stories), and I like to read to escape. And, I mean, I wasn’t exactly kidding myself about how this book would end. 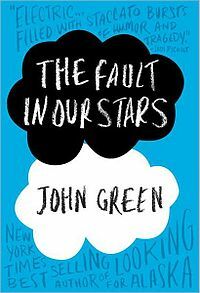 If you don’t already know, the story is of Hazel and Augustus, two teens living with the reality of cancer. And, spoiler alert, they don’t all live happily ever after. This is at times a very difficult book to read, but it’s full of so many happy and humorous moments that it balances things out a bit. Green’s writing is fantastic, and though it took me awhile to get through the book, I did enjoy it. I really liked the characters in The Fault in Our Stars. Augustus, especially. He is not perfect⎯even Hazel, who falls in love with him, sees his imperfections⎯but he’s definitely not someone to be passed over, either! Augustus and Hazel’s relationship is awesome, and I really wish I got to see more of them together with their friend Isaac. Their personalities were quirky and interesting, though I do have to admit that at times they seemed a tad too mature for teenagers (even though teens can be mature and teens having gone through the horror of cancer definitely can be mature). It was like the book was written for twenty-somethings who like to read YA, and I think that’s an awesome concept, but I still wondered whether (some) actual teenagers would really be able to connect with the story because of this. The thing I really loved about this book, however, was that it tackled some tough issues straight on. Obviously, the world of childhood and teenage cancer was a huge part of this story. And when characters were sick, their physical weaknesses, their lack of bodily control, and their emotional and mental struggles were all shown. These kids did not have any clear faith for what lay beyond life, and that was shown honestly throughout the entire story, even while some other tales might provide a divine kind of moment to wrap things up neatly. And The Fault in Our Stars also brings up the truth of another hard issue, that when a person dies, their faults are immediately forgotten, and they are remembered as having been perfect in every possible way. This is something that bothers me in life, because people are not perfect and I think we love people for their imperfections and we should celebrate people for who they were, not for the perfect person they weren’t actually. This book talks about that, and does a good job of avoiding it. I won’t be running out to immediately read more books on this subject, because I generally prefer happier reading. But this is a great book to throw into your mix. Sometimes it’s good to experience a different type of tale, and to see the life of someone else (whether that person is fictionalized or not). Definitely makes you appreciate what you have! A great book, and I’m looking forward to the movie! Some of the greatest fiction is so wrenching in topics and most definitely in endings. I love books that explore the dark side of the human condition, but, like you, I can only take one in a row; then I'm on to something that makes me forget that condition.